'Bay Seasoning' is a Luxury Villa with Pool, Marina, Gorgeous Bay Views, & you can bring the Family Dog! Sunset Bay Villa 221 is a fabulous Waterfront Condo that is Dog-Friendly & Sleeps 8. Amazing Bay Views from almost every seat in the house..... Gorgeous Sunset Bay is located directly on the Chincoteague Bay facing amazing Sunsets. This Luxury Condo even comes with a Boat Slip & Community Pool.... Take the Stairs or the Elevator to the 2nd Floor and let the fun begin. Looking toward the beautiful Foyer with Hardwood Floors. Bedroom 1 has a Twin, a Full, and a fun Nautical Theme. The Den has a Full & Twin Sleeper & Flat Screen TV - a great place to curl up with a good book. The Chef will love the Well-Stocked Kitchen - New Bar Furniture coming this Winter. Meals are a Bay Breeze with Gleaming Granite & Custom Tile Floors. Tons of space and a wonderful Island facing the Chincoteague Bay. The Open Floor Plan is perfect for entertaining & spending time together. Plenty of seating for all in the spacious Dining Area and at the Breakfast Bar. There is a convenient Full Bath with Tub/Shower Combo just off the Living Area. Light & Bright Living Area with stunning Views of the Bay, Marsh, & Drawbridge. Relax on the Balcony & take in great Bay and Pool Views. Bedroom 2 is a Bay Front Master with Balcony Access & amazing Views. Imagine waking up to such beauty every day on Vacation. Huge Master Bath with Double Sinks and lots of space. Relax in the Spa-like Master Bath. with Jacuzzi Tub. Walk-in Shower with Custom Tile in Master. Bring the Dog AND the Boat to Sunset Bay Villas..... There`s nothing like a Chincoteague Sunset over the Oyster Beds. Only minutes from Assateague National Seashore. Be sure to visit our Famous Wild Ponies.... Visit the Assateague Lighthouse while spending the day at the Beach. Welcome to beautiful Sunset Bay Villas on the Chinoteague Bay - pure Paradise! 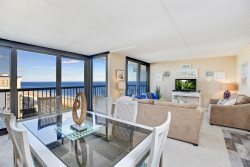 These gorgeous condos sit directly on the Bay with stunning Views of the Bay, Drawbridge, & the best Sunsets to be found. Lounge by the Bayfront Pool and watch Herons & Egrets frolic over the water. Try your hand at crabbing or fishing from the Community Dock - you can even bring your Boat if you like - tie it up in your very own slip! Sunset Bay 221 offers the Luxury you want, the Amenities you need, all at a family-friendly price - And you can bring the family dog! As you enter Sunset Bay 221, the spacious Foyer with Custom Tile is light, bright, & so inviting. As you wander down the Hall, this gorgeous Home opens up to lovely Views, a wonderful Open Floor Plan, and plenty of room for all. Relax in the Living Area after a fun-filled at the Beach and enjoy the Flat Screen Cable TV and Free WiFi. You can actually take in amazing Water Views right from the sofa! Overlooking the Marsh, you can watch the Herons & Egrets fish for their morning meal. With gorgeous Hardwood Floors and the colors of Sand & Sea throughout, Sunset Bay 221 is a Vacation Dream come true. Begin and end your days on the wonderful furnished Balcony watching the Fishing Boats come in and taking in those incredible Views. The Chef in your family will love the Gourmet Kitchen adorned in gleaming Granite and Custom Tile. The back splash is like a work of Art, pulling the whole room together in stunning fashion. With tons of space and everything you could possibly need, this is definitely a Cook's delight. And once again, you don't have to go anywhere to take in incredible Bay Views - even from the Kitchen. The Breakfast Bar seats 4 and is just perfect for a quick bite before hitting the Beach, and for more formal meals, there's plenty of space for all in the Dining Area. Don't feel like cooking on Vacation? Sunset Bay Villas is just a short stroll downtown to Dining, Shops, and so much more. Wander down to Robert Reed Waterfront Park for a Free Concert or Family Movie Night - awesome events are held all Summer! Sunset Bay 221 comfortably sleeps 8 in 2 Bedrooms plus Sleeping Den. The huge Waterfront Master Bedroom will make you feel as if you're waking on a cruise ship with Views in every direction! With Private Balcony Access, you can sneak out to stargaze while everyone else slumbers. And what a great place to enjoy your morning coffee! Decorated in refreshing shades of Sea Glass, it feels so light and beachy. The Spa-like Master Bath has Double Sinks, a Jazuzzi Tub, and Walk-in Glass Shower. Down the Hall, Bedroom 2 has a Twin and a Full, and is decorated with a fun Nautical Flair. The Den is a great room to hang out in, and also transforms into a perfect sleeping room for the kids with a Queen Sleeper Sofa, and Twin Sleeper Futon. There is also another TV in here for when a little "down time" is needed. A convenient Full Bath with Tub/Shower Combo is located nearby, just off the Living Area. One of the most special things about Sunset Bay 221 is that you get to bring the family dog along! Your furbaby will adore laying in the sun on the balcony and taking in that salty, sweet bay breeze. Life is short - take that trip, catch that sunset, find your happy place right here on Chincoteague Island. Seaside Vacations does not allow group rentals to guests under age 25. Therefore, online bookings for group rentals will not be honored. Friendly dogs welcome with $100 Pet Fee. Dogs MUST be current on Flea/Tick Preventative & Immunizations. No Cats. Water Access - Yes, Access to Pier/Dock for fishing, crabbing, kayaking, or bring the boat!